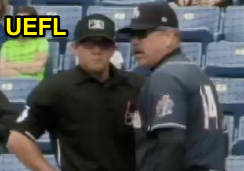 Double-A umpire Chris Scott's ejection of New Hampshire Fisher Cats Manager Gary Allenson and bench player Shane Dawson is our featured Minor League ejection. With two out and two on during the 4/29 Fisher Cats-Rumble Ponies Eastern League game (yes, Rumble Ponies, formerly the Mets), Ponies batter Tomas Nido hit a two-RBI triple off of Fisher Cats pitcher Justin Shafer, resulting in a post-play argument from Manager Allenson, who was ejected for arguing a ball call thrown to a previous batter (no video available). During Allenson's argument, bench player/off-day starting pitcher Dawson threw a trash can and chair out of the dugout and onto the playing field, resulting in his ejection as well, while Rumble Ponies ball boys were pressed into plastic-cup-cleanup duty as former Hartford Whalers victory march Brass Bonanza blared over the PA speakers. Broadcasting Quote of the Play: "We're told that was Shane Dawson, for some bizarre reason." Wrap: New Hampshire Fisher Cats vs. Binghamton Rumble Ponies, 4/29/17 | Video via "Read More"